Can I Transfer My Notary Commission If I Move Out Of State? Each state has its own application process, so Notary commissions, unfortunately, are not transferable between states. There is a specific protocol you must follow when resigning your position in California. First, to officially resign your Notary commission, you will need to send a letter to the Secretary of State. Second, you will need to submit your Notary journals to your county recorder’s office within 30 days from your resignation. You must also destroy your seal stamp and/or seal embosser as they could otherwise be used to commit fraud. What if you own residential or commercial property in two states. And you spend a significant amount of time in both states. Can you be a notary on both states? Hi Elizabeth. It depends on the laws of the states in question. Can you be more specific which ones, please? We are planning to move from Delaware to Florida. What will my process be to continue being a notary. Hello. You will need to resign your Delaware commission and apply for a new commission in Florida. If you are a notary in California and decides to move to Nevada...do you must resign as notary in California even if you wont apply to become a notary in Nevada. Can you just let the current california notary commission expire and then turn in the journals to the county recorder in california? Hello. California Government Code Section 8209 states that if a CA Notary resigns his or her commission or allows the commission to expire, the Notary must deliver all notarial journals, records, and papers to the county clerk's office where the Notary's oath of office is filed within 30 days. The Secretary of State's Notary Public Handbook, page 23, advises Notaries to send a letter of resignation to the Secretary of the State's office if the Notary wishes to resign his or her commission. What if i am moving from california to texas and i have a resdential address for both states? Hello. You cannot transfer a CA Notary commission to Texas. You would have to apply for a new Notary commission in Texas when you move. What if someone is a notary and they move to another state for a year and then move back to the state in which they are a notary and is a resident again. Is the notary still valid or will they need to reapply? Hello Ann. To help us answer your question, can you specify which states you are referring to? Hello. A Florida commission is not transferable to another state. You would have to resign your Notary commission and apply for a new commission in Louisiana. Please be aware that Louisiana Notary qualifications, training, testing requirements and duties are significantly different than in Florida. Hello. No, Notary commissions are not transferable between states. If you are moving to Florida, you would need to meet that state's commissioning requirements first then apply for a new commission in Florida. I will be moving from Florida. I do not recall that I was required to turn in any documents - I have them all but I did allow my commission to expire some time ago and then recently reapplied per my employer. I will now be leaving the state, I may or may not apply in Indiana. Hello Dani. If you're referring to your journal records, while Florida does not require a journal by law, if you keep one the Governor's office recommends retaining your completed journal for at least five years after the last date of entry. If I was a Notary Public for the State of California, and I've recently moved to Arizona and want to reapply for an Arizona commission, can I still use the $5000 bond that I purchased in California, or do I have to repurchase another $5000 bond here in Arizona? Hello. Arizona law requires the surety bond to be obtained from a state-licensed surety and the bond must be effective for four years, beginning exactly on the effective date of the Notary’s commission. The bond’s effective date may not overlap the expiration date of any previous bond, even by one day. Finally the bond must not be issued more than 60 days before or 30 days after its effective date (ARS 41-312[B] and 41-315[A] and [B]; AAC R2-12-1103[A]; RM). Can I keep a notary license for more than one state at a time if you take and pass the state's law. Hello. To help us answer your question, can you please tell us what state you are located in and what other state you are interested in obtaining a commission for? When changing from Virginia to North Carolina will I need to take your learning course and exam again? Hello Paul. Can you please clarify which course you are referring to? i'm a notary in california, I have both house in california and florida. i live in florida for the summer june 1 - august 31, the rest of the year i live in california. can I do notary while i'm in florida for the summer. if so how can I do that, please give me some advice. Thank you very much! Hello. You must be a legal resident of Florida in order to hold a Notary commission there. Part-time residents may not hold a Florida Notary commission. Can I hold a Notary Commission in both TX and NY if I reside in TX? Hello. To hold a New York commission you must be a resident of New York or have an office or place of business within New York. If I am moving to AZ but don't want to do notary there and move back to CA can I still keep my commission or do I have to automatically cancel when I move out of state? if I do cancel when happens when I come back do I start process all over again? Hello. You would have to resign your CA commission if you move out of state. Should you return to California, you would need to apply for a new commission. I'm moving to Georgia soon and would like to continue being a signing agent. What do I need to do? Hello. Only a lender or a licensed Georgia attorney may conduct settlements and disburse closing funds in the state; and the law further prohibits anyone other than the settlement agent for the entire transaction from overseeing the closing session (OCGA 44-14-13). I AM CERTIFIED TO NOTARIZE DOCUMENTS IN NEW YORK. WHAT IS REQUIRED TO TRANSFER TO NEW JERSEY? Hello. Notary commissions are not transferable between states. If you wish to obtain a New Jersey commission, you will have to check if you qualify for a Notary commission in that state and submit an application for a new commission there. My Notary Public commission expired in Maryland. I am re-applying in the state of Florida, do I have to resign as Notary Public in Maryland?, even though it expired in 2018? Hello. If your Maryland commission has already expired and you have chosen not to renew, you do not need to take additional steps to resign the commission. You will need to keep your registry (Notary journal) for at least five years. I am a notary in Georgia but just recently moved to Florida and would like to be a notary here. Am I able to transfer? If not, do I just apply as a "new" notary? Thank you. Hello. No, Notary commissions are not transferable between states. You would need to resign your Georgia commission and apply for a new commission in Florida. I am a notary in texas and moved to CO for a couple years and am now back in Texas and my notary in Texas will not expire until 2020 is it still valid? Hello. No, you will need to apply for a new Texas Notary commission, since out of state residents may not serve as Texas Notaries. Notaries who move their residence from Texas automatically vacate the office (GC 406.020; 1 TAC 87.50[c]). Hi, I have notary commission from Kings County (Brooklyn), New York and live in Brooklyn, NY. But, I work in New York city. I'm planing to move to Pennsylvanian soon, but will continue to work in New York city. Can I keep my New York notary commission? Hello. A Notary resident of New York State who moves out of state but still maintains a place of business in the state may remain a Notary; otherwise, the office of Notary is thereby vacated (EL 130). I live in GA but work in Florida (I live on the state line) Can I get my notary in Fla? Hello. No, only Florida residents may apply for a Florida Notary commission. I will be living in 2 different states 6 months at a time, can I apply for a second Notary commision so I can hold it in both states? Hello. To help us answer your question can you please tell us what two states you will be residing in? Hello. No, Indiana requires Notaries to be full-time, permanent legal residents. If at any time an Indiana Notary ceases to be a full-time resident of the state of Indiana, their commission becomes invalid and must be relinquished. An Indiana notary cannot reside or claim primary residency anywhere outside of this state. Arizona requires a Notary to either be a registered voter in Arizona or list Arizona as the state of permanent residence for income tax purposes. You would have to give up your commission in whatever state you do not meet the permanent residence requirements in. I am a CO notary and will be moving to WA, but will still be employed by my same company based in CO (I will be working remotely). Can I maintain my CO notary? Hello. A Colorado Notary must be a permanent resident of the state or have a place of employment in the state. We would recommend contacting the Colorado Secretary of State's Notary program at 1-303-894-2200 to ask them if remote employment with a Colorado business will allow you to meet this requirement. I live and do business in NYS. I will be moving right over state border to CT, can i keep my NYS notary since I will continur business in NYS? Hello. A New York Notary who moves out of state but still maintains a place of business in New York may remain a Notary; otherwise your commission is vacated (EL 130). You will need to file a change of address form with the Department of State's Division of Licensing Services. Hello. I hold a notary commission in California and will be moving to Nevada for a year and be traveling back and forth after. Is it possible to hold a commission in California and acquire a new commission in Nevada for the time I’m in Nevada? In other words can I hold to commissions at the same time from two states? Hello. It will not be possible for you to hold a CA Notary commission if you move to Nevada. California does not permit out-of-state residents to hold CA Notary commissions. Can I hold notary commissions in both California and Colorado if I have residences & employment in states? Hello. Colorado applicants must either be a resident or have a place of employment in the state (CRS 24-21-521). California applicants must be a legal resident of California (GC 8201). I'm a Notary in the state of California, can I obtain a Notary commission in Nevada whilst maintaining the Notary commission in California? Hello. To be eligible for a Nevada commission, you would need to maintain or be employed at a licensed place of business in Nevada (NRS 240.015). If I am a notary in New York and have a job in New York and a home in New York and am buying a condo in Florida and live in New York for six months and Florida for six months, can I be a notary in both states? I need a notary to work. Hello! I'm a notary from NJ that has recently moved to TN. What is the process of replacing or renewing my license. I don't assume I can keep my NJ one. I had to ask. Hello. You will need to apply for a new Notary commission in Tennessee. 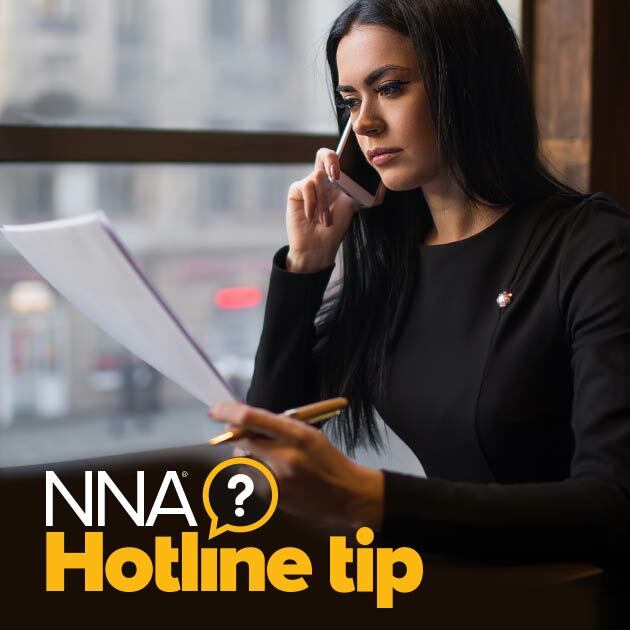 You will need to either obtain an application form from your local county clerk's office or you can contact the NNA for assistance in applying for a commission at 1-800-876-6827. I am a freelance court reporter in NY, and so have my notary strictly to swear in witnesses. I am planning on moving to Florida and working as a freelance stenographer there. I can at times take telephonic depositions with and for my NY clients. Can I keep my NY notary and do I have to retake the test in Florida? Hello. In order to hold a NY Notary commission, you must either be a resident of New York or have a place of business in the state. If you are moving out of state and will no longer be working in New York, you will need to resign your NY commission and apply for a new Notary commission in Florida. I’m a notary in SC but have moved to NC. What do I need to do to become a notary in NC?